To provide accurate information about Christian Science and its activities to media and general public. Support, advice and information for anyone. A friendly support group set up and run by parents. Everyone welcome. Offering information, help, advice and just a general chat with like minded parents whilst children play in a safe environment. Offers home visits in Torbay and South Hams free of charge to those who cannot visit an optician unaccompanied. Sight tests are free to those who qualify. Grange Lea is a family-run retirement home of quality, character and warmth in Preston on the outskirts of Paignton, in the southwest of England. Surgical chiropodist/podiatrist. Practice established for over 5 years. Home visits available in Paignton and Torquay on Thursdays and Fridays. Young's Park People are a democratic, voluntary group, dedicated to caring for, and cherishing Young's Park in Goodrington, Paignton on the English Riviera in Devon England. Come and join our free buggie fitness group in Victoria Park Paignton, for mums with buggies. Young parents (under 25s) are invited to drop into our friendly play cafe where your child can play in a safe environment and try out lots of different activities, while you can find out more about what the Children's Centre can offer you. This is a group for children aged 18-24 months. It will help to develop their listening and talking skills. The Paignton Community Larder is a new foodbank born out of Anode that opened in December 2017. We serve the Paignton community with food parcels to those families and individuals suffering from poverty and crisis situations. A five week baby massage course which aims to strengthen the emotional bond between you and your baby. Please book a place and call to confirm a start date. Braeside Neighbourhood Nursery is a privately owned nursery, caring for young babies and children aged from 3 weeks to 5 years. This group provides parents and carers with emotional support, advice and sign posting from experienced and familiar staff. A friendly support group for childminders and open to grandparents offering information, help and advice. Friendly support and advice drop in group for anyone breastfeeding. 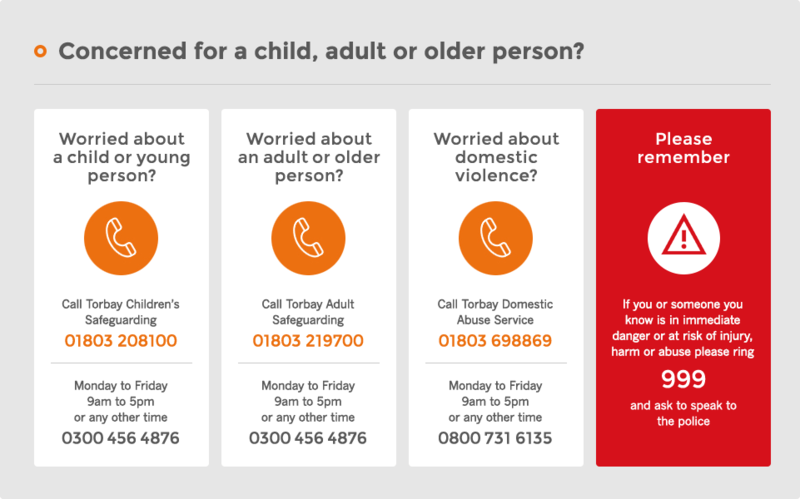 The information and advice service is available to all older people, their family, friends, carers, and those who represent them, throughout Torbay. A relaxed and entertaining afternoon for over 50s with guest speakers on almost every topic under the sun. With a free cuppa! Burnside Court is a residential home in Paignton, Devon providing accommodation and care for up to twenty six people. People living at the service are older people, most of whom have dementia. SUPPORT people to express their views and wishes, especially those who are vulnerable, isolated or marginalised. Quay Dental Care is conveniently located at 21-23 Dendy Road in Paignton. With a friendly, caring and highly experienced team and a comfortable, clean and relaxed environment you will always be made to feel welcome at our practice. Offer Aikido training which is based on movements derived from the Japanese sword and staff battle arts. There is no competition element in Aikido, pupils co-operate with one another to enhance their learning. Friendly, family run organisation teaching judo to children and adults. Judo is an ideal form of physical exercise, improving stamina, general health and overall fitness. The children's classes also provide great fun with plenty of games. An exciting school with an irresistible curriculum and high expectations, committed to care, adventure and success. Total Communication Now is a community based service which promotes the use of all communication skills. We offer practical advice and support for anyone with a communication disability or difficulty, their family, carers or support staff. Torbay Council Connections and Call Centre Did you know that you can access most of our services online via our website www.Torbay.gov.uk? If you do need to contact us our call centre is open from 9am till 5pm Monday to Friday, we are closed on Bank Holidays. Paignton library offers an informal space open to all, where books, cds and dvds can be borrowed. Internet access is available, events and activities for children and adults take place. Cafe available on the premises. The Torbay Tech Jam is a free, informal and family-friendly monthly event whose primary effort is to inspire children to take an interest in computing. Are you a female living in Paignton, Torbay or Brixham? Are you looking to make new friends? Do you have a bit of spare time and would you like to help make a difference in your community? This Community Partnership provides an opportunity for the local people who live or work in the central area of Paignton to discuss issues of common concern and influence the way in which services are provided in their area. local community whilst overcoming or managing barriers in their life. School Pastors patrol the streets around secondary schools for a couple of hours as the schools close, generally for two afternoons a week. We work closely with the school and provide an extra layer of support for the students. Our Junior Keeper Experience is a dream come true for young animal lovers where they'll work as a young zoo keeper for the day. Local pharmacy offering Asthma service, Diabetes service, Blood Pressure Testing service, Stop Smoking service and Prescription MOT service. Giving people like you the power to change! Torbay Voice is a group of people who have used or are using support services in Torbay. General food store – fruit and vegetables, groceries, frozen foods, flowers, confectionery, lottery, alcohol, in-store bakery. Area: Torbay (inc. Preston, Marldon and Cockington). We are a team of 12 Midwives and 1 Maternity care assistant who work shifts to cover 24 hours per day. We are a fully integrated team which means we provide care where the client wishes - either at home or in hospital. Currently we have a 7% homebirth rate. A care home without nursing that has 22 beds. Registered to provide care for older people, people with physical disabilities and people with dementia. We are a Roman Catholic parish within the diocese of Plymouth. Then come to Frankies crèche, experienced caring & friendly DBS checked staff run by Claire Burns. Our Youth Theatre is perfect for any youngster who wants to experience performing. Information and support before the arrival of your baby. A four week group talking parents through the labour, birth, breastfeeding, transition to parenthood, attachment and bonding. Levanto Residential Care Home is a care home without nursing for older people, people with dementia, people with a physical disability and people with a sensory impairment. It is registered for a maximum of 20 service users. We are a charitable trust that provide weekly soccer courses in various locations for children aged 3 -14 years. We also provide holiday courses and work with local school to provide football activities. Little Pumas syllabus prepares a child mentally as well as physically. It improves their hand-eye coordination, team work skills, communication and verbal skills. A company established by long term friends and colleagues Ashley Hone, Rachel Mayhew and Richard Hanbury. With over 30 years combined experience of outdoor practice and a real passion for the outdoors. Health Visitors deliver family centred public health to the community and are linked to primary care through GP practices. Care home without nursing. Home has 29 beds and specialises in providing care for older adults (over 65). Apprenticeships and NVQs in Business Administration, Customer Service, Leadership and Management. We also offer Day and Evening classes in Computer skills and ITQ. Applicants invited from all age groups and genders. For more information please contact the secretary weekday mornings from 9:00 to 14:00. A person with a learning disability has impaired intellectual ability. They may experience difficulty with everyday activities such as household tasks, socialising or managing money. A learning disability affects someone for their whole life. Cerebra is a unique charity set up to help improve the lives of children with brain related conditions through research, education and directly supporting the children and their carers. There is a Minor Injuries Unit (MIU) and X-ray facilities (see opening times). Small residential care home for up to 6 adults with autistic spectrum disorders. Paignton Branch, the Royal British Legion meet at the Paignton Conservative Club, Palace Avenue on the first Wednesday of every month at 19:30. Afternoon bingo for those of you who prefer daylight sessions at the Conservative Club, Palace Ave.
Hall and bar open to all. Pembroke House Surgery is a friendly family practice. Grosvenor Road surgery is a branch site of Pembroke House Surgery located near the town centre in Paignton. Curledge Street Academy is part of the Bay Education Trust along with Paignton Community & Sports Academy and King's Ash Academy. • Improve their English language skills. • Develop skills, confidence and understanding to support language and learning at home and at school. • Be able to communicate more confidently with the school and community. We believe that Jesus Christ, the Son of God, came to earth and lived amongst us, was crucified for our sins, then three days later was resurrected and that through belief in him, we have an eternal hope.